PART ONE: INTRODUCTION. 1. Introduction, Framework and Definitions. 2. Nineteenth-Century Background. 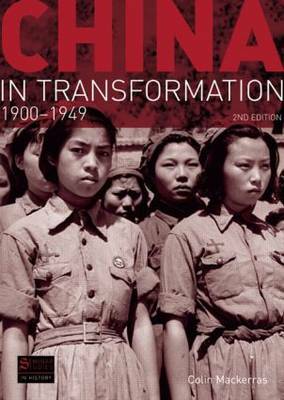 PART TWO: CHINA IN TRANSFORMATION, CHRONOLOGICAL TREATMENT. 3. The End of the Qing Period, 1900-11. 4. The Revolution of Sun Yat-sen. 5. Warlords, New Culture, 1916-28. 6. The Nationalist Movement and Revolution. 7. The Nanjing Decade, 1927-37. 8. The Chinese Communist Party. 9. The War against Japan 10. Post-War China, The Civil War. PART THREE: THEMES OF CHANGE. 11. Aspects of Society: Family and Women, Religion and Secular Ideology. 12. Education and the Student Movement. 13. Literature and Theatre. PART FOUR: CONCLUSION. 14. Conclusion and Evaluation. PART FIVE: DOCUMENTS.